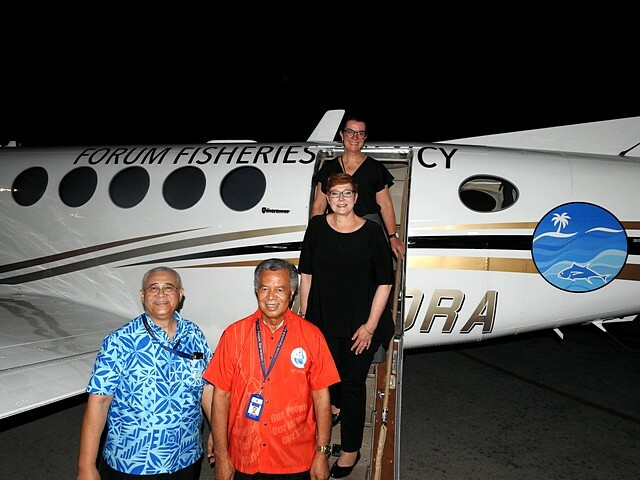 NAURUPIF 2018, Yaren –5th September 2018--Pacific Forum Leaders have welcomed the increased air surveillance capacity of the new Forum Fisheries Agency (FFA) Aerial Surveillance Program funded by Australia under the Pacific Maritime Security Program, PMSP. In a special event hosted at the Nauru International Airport this evening, leaders were able to inspect one of two King Air200 aircraft, fitted with high tech sensor, avionics and communications technologies capable of detecting fishing vessels over a broad range of ocean. "The Aerial Surveillance program is ensuring we have more Pacific eyes in the sky on fisheries activity across the exclusive economic zones of our Pacific member nations," says FFA Director General James Movick. "Today is an exciting milestone for fisheries surveillance, as well as broader law enforcement supporting the protection of our oceanic resources for the benefit of our people." Chair of the Forum Fisheries Committee, Cook Islands Prime Minister Henry Puna, in launching the program, commended the efforts of those involved in bringing the initiative to fruition, heralding "a new era in Pacific maritime security capability." 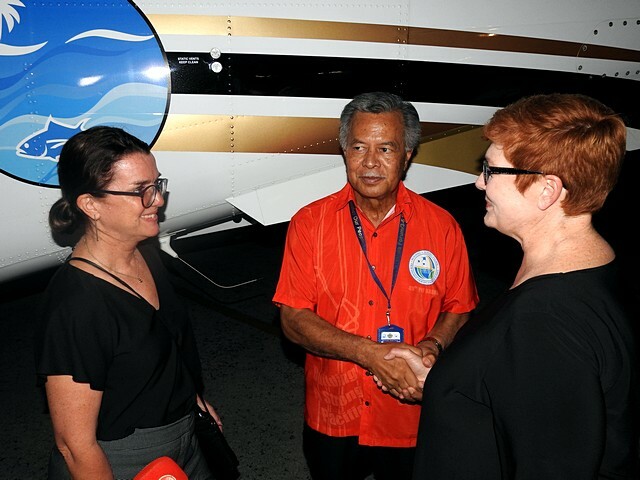 "On behalf of Leaders, I acknowledge with gratitude Australia’s 30-year support towards our region’s maritime surveillance capacity, initially through the Pacific Patrol Boat program and now this added capability of aerial surveillance. This program has given regional governments the confidence to add the services of civilian contractors to our on-going support from the QUADS (defence assets of Australia, France, New Zealand and the United States). The planes will be placed under the operational control of the Forum Fisheries Agency, and provide air surveillance service to FFA member countries, based on regional risk assessments and responding to nationally-determined air surveillance tasking. Forum Fisheries Ministers as well as Forum Leaders thanked outgoing FFA Director General James Movick for "upholding the legacy of excellence in strength through cooperation against Illegal, Unreported and Unregulated (IUU) fishing in our waters, and for keeping the work of many years on track to enhance Pacific maritime domain awareness." The King Air aircraft has been taking part in ‘Operation Frigate Bird’ – a fisheries surveillance operation taking place in Nauru waters this week. 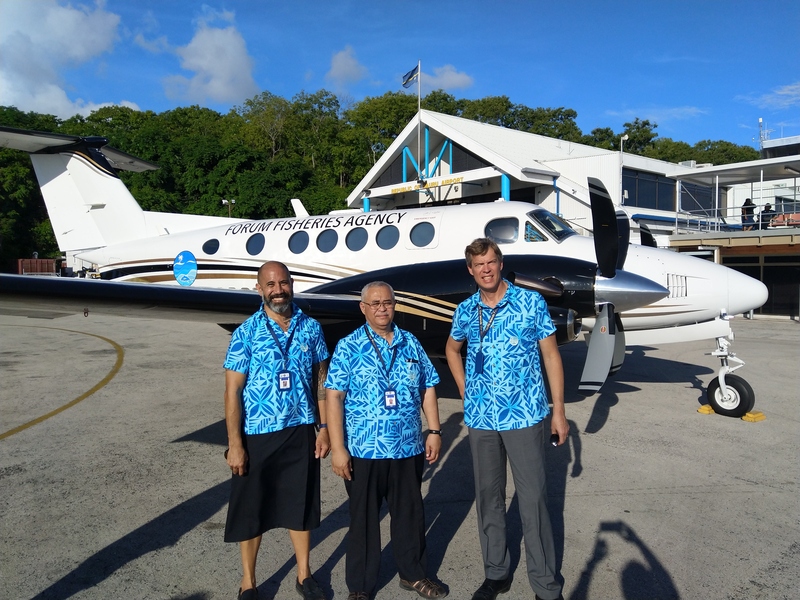 Nauru has partnered with Kiribati to bring the Kiribati patrol boat Teanoai to Nauru, with the new Aerial Surveillance plane supporting the sea-surface patrol.